Chicago might be the deep dish capital of the world, but you don’t have to travel to the Windy City for a slice of this classic thick pie. The homemade version is just as delicious, so check out this recipe for Chicago-style deep dish pizza. 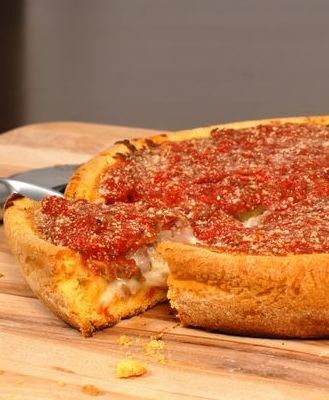 Rumor has it that the original deep dish pizza recipe was invented in Chicago back in the 1940s, and since it has become one of the signature dishes of the city. Oftentimes we call “pizza” a “pie,” but with this deep crust and the stacks of toppings, it really does resemble a pie! One thing to remember: This recipe uses instant yeast, which is different than active yeast you need to proof with water. If you’re using active yeast, you need to let it proof before adding it to the rest of the dough ingredients. To make the dough, mix all the dough ingredients together and knead them by hand or with a mixer for about 7 minutes (use a medium-low speed with the mixer). Then, put the dough in a lightly oiled bowl, cover it, and let it rise for about 60 minutes until it’s nice and puffy. When the dough’s almost done rising, start preparing the sauce. Melt the butter in a medium saucepan over medium-high heat, and then add the onion, oregano, and 1/2 teaspoon of salt. Cook the onion for about 5 minutes, until it starts to get tender and translucent. Add the garlic to the sauce and cook for about a minute, then add the tomatoes and sugar. Bring the heat to high so the sauce starts to simmer, then lower the heat to medium-low and let it simmer for about 30-35 minutes (it should reduce in size by about 2 cups). Get your deep-dish pan ready you can use a 14-inch pan, cast-iron skillet, or two separate 9-inch pans (springform cake pans work really well for this). Grease the entire thing with cooking spray and drizzle 3-4 tablespoons of oil into the bottom of the pan, making sure the bottom and partway up the sides are evenly oiled. Stretch the dough with your hands to make as big of a circle as you can, then lay the dough in the pan and stretch it until it starts to shrink back. Cover the dough and let it rest for another 15 minutes, and preheat the oven for 425 degrees F.
Stretch the dough to cover the bottom of the pan and then press it up the sides of the pan with your fingers. Let the crust rest for another 10-15 minutes, and then bake it for 10 minutes until it’s just starting to brown. It’s time to check the sauce once it has reduced by the 2 cups mentioned before, take it off the heat, add the basil and oil, and season with salt and pepper to taste. Take the crust out of the oven and cover the bottom with cheese. Add whatever toppings you like, and then spoon the sauce on top of everything (enough so the sauce isn’t as high as the crust you want to leave a little room there). Sprinkle the top with Parmesan cheese. Bake for about 25 minutes, or until the cheese on top starts to brown and the crust starts to look golden-brown. Let it cool for about 15 minutes.